Finding postpartum beauty in a perfection-obsessed era. I began to feel different about the definition of beauty after the birth of my second baby. 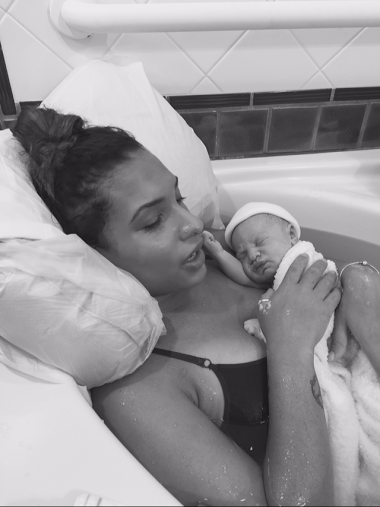 It was my first experience with a natural water birth, which quickly became the most powerful and transformative moment of my life. I was so in awe of my own body that I could no longer look at myself the same. I was suddenly proud to wear every stretch mark, which I had previously tried everything in my power to hide. I finally realized the miracle of our bodies in being able to grow and sustain life, and in that moment, I felt I had discovered the complete essence of the word beauty and it changed me. Perfection is almost always associated with what is portrayed as beautiful. Perfect hair and makeup, flawless skin, slim bodies, round breasts. I couldn't help but realize that most women who have ever birthed a baby couldn't relate to the word "perfection," so how does that translate to the way she feels about herself and her body? I decided to upload a photo of myself and kids to Facebook, breastfeeding and exposing my postpartum body (stretch marks, saggy skin and all!). Although I debated whether or not I should post such a vulnerable photograph, I'm so happy I did because I could have never imagined the response it received. Hundreds of women used my post as an outlet to share how they felt about their own "imperfect" postpartum bodies, in a place where they could be celebrated, rather than judged. One woman's Facebook comment really resonated with me. She wrote, "This is beautiful. It might seem silly but it kind of gives me encouragement. After having my son, I have great difficulty seeing myself as beautiful anymore. I have major stretch marks and saggy skin on my stomach from how big I got. I have lost all of my baby weight, but I still look at myself with a bit of disgust." Reading this comment hit me hard because most of us have felt those exact words after the birth of our babies. As soon as our little miracles are born into this world — and the awe of our courage and bravery begins to fade — we look at our bodies and the first emotion that comes to mind is disgust? This realization saddened me, but it also encouraged me. Yes, learning to love our "new" skin will take some time. It took me five years. But something as small as posting a picture of your "flaws" can become such a wonderful bonding experience with others who are in similar situations. To me, that's the light of social media. We need to stop censoring motherhood, from breastfeeding to stretch marks, on social media. We need to show what true motherhood is and looks like. There aren't many things left in this life that are completely natural and organic experiences to connect us to this world, so why hide it? Own it! There's great power in an image, and living in an society with thousands of photoshopped mages at our fingertips daily, we have responsibility to spread a raw, real message instead. Share your perfectly imperfect photos. You never know who you're inspiring.